The FDT-80 Series has been discontinued. Please see the FDH-1 Series as a possible alternative or contact our Flow Engineering Department. The FDT-80 Series of portable transit time flowmeters feature the world’s most advanced non-invasive flow measurement technology, providing a measuring system with unsurpassed accuracy, versatility, ease of installation and dependability. Although designed primarily for cleaner liquids, the flowmeter can also reliably measure liquids containing moderate amounts of suspended solids or aeration. 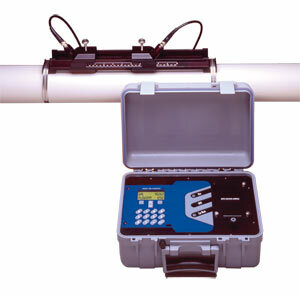 FDT-80 is designed for long or short term flow measurement surveys on full-pipe liquid systems and is ideal for verifying calibration of permanently mounted flowmeters of all types. The flowmeter features a tactile keypad, 24-hour battery (rechargeable), and a 128 x 64 pixel, back-lit graphics display - all integrated into a rugged, watertight enclosure. The FDT-80 systems utilize proprietary dual timebase time expansion algorithm, advanced DSP and digital cross-correlation. The cost effective and versatile FDT-80 flowmeter comes complete with all accessories necessary for measuring piping systems from 50 to 2540 mm (2 to 100"). FDT-80 Series has a flow measuring range that exceeds 4000:1. This feature allows the instrument to measure normal process flow rates as well as flows resulting from leaks in piping and valves. User configurable rate and totalizer units include: feet, gallons, ft3, million-gal, barrels, acre-feet, lbs, meters, liters, m3, million-liters and kg. Non-invasive clamp-on transducers are simple and cost efficient to install. Since the transducers do not contact the liquid, fouling and maintenance are eliminated. Automatic Reynolds Number compensation assures accurate measurements through the laminar, transition and turbulent system flow regions. An integral 24 hour rechargeable battery allows extended operation when AC power is not available. Both AC and cigarette socket style power adaptors (battery chargers) are included. Compartmentalized and padded carrying case keeps the FDT-80 meter and all of its accessories organized and protected. Power converter, 230 VAC, U.K.
참고: Comes complete with NIST certificate, AC and automobile power adaptors, carrying case, acoustic couplant, standard sensors, straps, cables, mounting track, and operator’s manual. High Temp and Small Pipe Transducers are available as an accessory. Please consult Flow Engineering for details.